If you’re planning to apply for a loan anytime soon — or even if you just want to establish good credit — it’s important to know exactly where you stand in terms of your credit score. Having a good or a bad credit score can essentially set the tone for whether or not you are approved for credit, as well as for how much you may end up paying lenders and creditors for the money you borrow. This is critical info, so let’s dive in! What Is Considered a Good or Bad Credit Score? Can You Get a Loan If You Have a Bad Credit Score? Knowing your actual credit score can be somewhat complicated. That’s because there isn’t just 1 single specific credit score, per se. Rather, there are literally hundreds of different types of credit scores. However, the most popular of these are your FICO score and your VantageScore. Your FICO score is your credit score calculated via the Fair Isaac Corporation. Here, your score is based on information maintained at the credit reporting agencies. The 3 big credit bureaus are Equifax, Experian, and TransUnion. Because all lenders and creditors do not report information to all 3 of these credit bureaus, though, your score can actually differ from one to the other. Although FICO scores are used by the majority of lenders and creditors, there are other ways of determining a person’s creditworthiness. For instance, a VantageScore is a consumer credit scoring model created through a joint venture with the 3 major credit bureaus. Overall, credit scores can range from a high of 850 to a low of 300. The higher your score, the more likely you are to be approved for loans and other types of credit, as well as to attain a lower monthly payment (and thus a lower cost of borrowing overall). Knowing whether your credit score is “good” or “bad” is important and helps you make (the right) financial decisions. So, Where Exactly Do You Fall Compared to Other Consumers? 800+ Exceptional Well above the average score of U.S. consumers. Demonstrates to lenders that the individual is a good credit risk/exceptional borrower. 740 to 799 Very Good Above the average of U.S. consumers. Demonstrates to lenders that the individual is a very dependable borrower. 670 to 739 Good Near or slightly above the average of U.S. consumers. Most lenders consider this to be a good score. 580 to 669 Fair Below the average score of U.S. consumers. Many lenders may still approve loans with this score. Below 580 Poor Well below the average score of U.S. consumers. Demonstrates to lenders that the individual is a risky borrower. Bottom Line: Just like having good grades on your report card, ensuring you have a good credit score can benefit you in many ways — and for the rest of your life! Check your FICO score regularly to make sure you’re on target. Although it may not be easy (and can require a bit more legwork), it is possible to get a loan and obtain other types of credit even if you have a bad credit score. If your credit score has taken a hit due to late payments or from filing bankruptcy in the past, you can definitely work to improve your score. Obtaining a Secured Credit Card – One way to start rebuilding your credit is to obtain a secured credit card. With these cards, you make deposits into a savings account, which then secures a line of credit. By making small purchases and paying off the account in full and on time each month, you will be able to build your credit back up. When using this credit-building strategy, be sure to use a card that reports to all 3 of the primary credit bureaus, as this can help maximize your efforts. Applying for Retail Credit Cards – You can also obtain some retail or department store credit cards (Comenity and Synchrony Bank are behind most of these cards). They will typically have less stringent qualification requirements than the major credit card companies like VISA or MasterCard. Here again, be sure to make some smaller purchases, and then pay off the balance(s) in full each month. Opening a Savings and/or Checking Account – Opening a savings and/or checking account at a bank or credit union can help rebuild your credit, as well as establish an emergency fund. That is because this can help you build up a financial “cushion,” which in turn can make it easier to repay your loan(s) or credit card balances each month. When opening up a checking or savings account, though, be sure you choose an account that does not require a large initial minimum balance, as well as one that doesn’t charge hefty monthly fees. 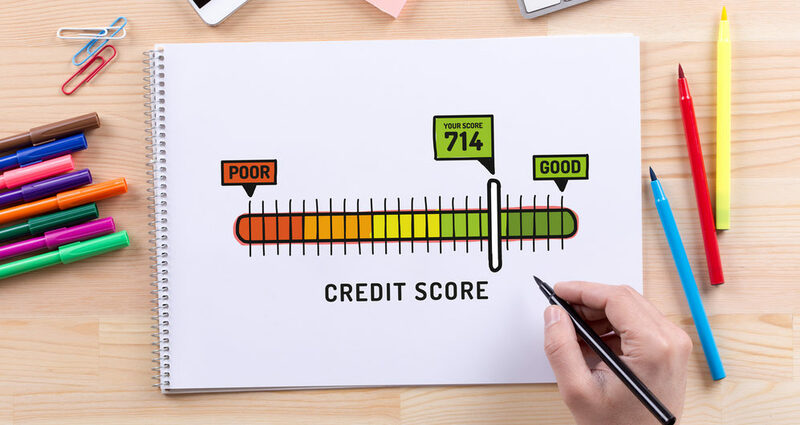 Although just a few points on your credit score may not seem like a big deal, the reality is that this score is considered by lenders and creditors to be a key indicator of how reliable you are at repaying your debts. Therefore, a lower credit score can equate to being a higher risk, and vice versa. If a creditor sees you as a higher risk, they may still loan you money or offer you credit. However, they must also be compensated for the additional amount of risk they’re taking on. Typically, they will do this by requiring a higher interest rate — which means you’ll need to pay a higher monthly amount on your loan(s) and credit card balances. While this may not appear detrimental at first, the reality is that over time the difference can really add up. For instance, let’s say you and your best friend are in the market to purchase a new home. In this case, you have each found the house of your respective dreams, and will each need to borrow $300,000 via a 30-year fixed rate mortgage. There is one big difference between you, though: your credit score is only 620, while your best friend’s score is over 750. Based on a review of your credit scores, your best friend secures an interest rate of 4.25 percent, while your rate is a tad bit higher at 4.75 percent. In terms of monthly payment, you will owe the mortgage company $1,575 per month, while your friend will only have to pay $1,476 each month for the same amount of money borrowed. Although the difference is just $89 per month, when you factor in 30 years of this difference, you’ll end up paying ~$32,000 more for your new home! (360 months X $89 per month = $32,040). With that in mind, it’s easy to see just how much of a difference having a good credit score can make. The good news is that there are some things you can do to help increase your score going forward. A low credit score can affect your ability to obtain a loan or credit, as well as have an impact on the interest rate you’re offered by lenders and creditors. However, a low score can also be improved. There are a number of things you can do to turn your credit score around. By following these 5 simple tips, you could even start to see a low credit score improve in just a short period of time. If you already have a good credit score but would like to see some improvement, you can accomplish that too by following these simple strategies. Payments that you make on your accounts — even if they’re just a few days late — will have a negative effect on your credit score. Therefore, be sure to pay all your bills on time, no matter how insignificant they may be. Sometimes setting up automatic payments (or even signing up for payment reminders) can help keep you on track and on time. With autopay, you can set up the payment to make just the minimum, though paying off the whole amount each month is better (and will reflect better on your credit score as well). It may be somewhat difficult to stay out of debt, especially if you have many obligations like a home mortgage, vehicle loans, and other forms of debt. However, reducing or eliminating your debt balances where possible can go a long way toward helping you get and keep a better credit score. One of the best ways to stay out of debt is to stick closely to a budget. By making sure you have more dollars coming in than going out every month, you can keep your debt in check. A few of the easiest ways to accomplish this are avoiding impulse purchase, and always sticking to your shopping list when in a store. If you do have to borrow for a necessary item, be sure you keep your balance on the low side. In the case of having to carry a debt balance (i.e., carrying over a credit card balance from one month to the next), be sure you chip away at it each month until it’s paid off. Only paying the minimum amount on credit card debt will tend to keep you in debt for a much longer period of time. It’s easy to fall for promotions offered by credit card companies, like free items in return for applying for one of their cards. But unless you really need the additional credit, applying for new cards can actually affect your credit negatively. In fact, whenever an inquiry is made into your credit, you could receive a slight “ding” in your credit score — particularly if it happens excessively. That being said, if your credit is good and your current debt load is manageable, shopping for credit cards can provide a great way to build up points that may be used for free/heavily discounted travel and other nice benefits. One of the very best ways to ensure a better credit score is to regularly check your credit report. Mistakes are often made on the credit reports of many consumers, which means your score could be suffering from an event that isn’t even related to your credit. Therefore, make a point to check your credit report at least once per year. If you do find inaccurate information, write a letter to the credit reporting agency immediately to have it removed. This can also help prevent inaccurate information from affecting your credit score any more than it already has. Bottom Line: It’s important to keep in mind that your credit score can (and typically does) change over time. These changes — both up or down — will be based on new information reported by the credit bureaus. We recommend you check your credit score on a regular basis. There are several ways to check your credit score, as well as your credit report, at no charge. First, all consumers are allowed to obtain a copy of their credit report each year for free by visiting AnnualCreditReport.com. Here you will be able to view your credit report from each of the 3 big credit bureaus: Equifax, Experian, and TransUnion. You can also go to several different websites to check your credit score for free. These include Credit Karma, Credit Sesame, and Quizzle. These sites will typically update your score each week. In addition to making sure you keep your credit score as high as possible, it’s also important to make sure your credit information is kept safe. Due in large part to the vast rise in identity theft, it’s possible that your data could get into the wrong hands. In fact, the convenience of online transactions has added numerous risks to your information. If you do end up falling victim to identity theft, it can wreak havoc on your credit too. Identity theft can occur if you have personal information that is compromised, such as your Social Security number or credit card details. In many cases, thieves will use a person’s information to open up new accounts or apply for loans in the victim’s name. Unfortunately, it can take many months (or even years) to fix these situations. The good news, however, is that there are ways you can protect your credit and help prevent ID theft from happening. Monitor Your Credit Report – Keeping a close eye on your credit report can help ensure it doesn’t contain accounts that aren’t yours, such as credit cards you didn’t open. This is why it’s important to take advantage of your free annual credit report by visiting AnnualCreditReport.com. Ideally, though, you should review your credit report more often. Shred Important Documents – Any documents that contain sensitive information such as your Social Security number or bank account numbers should be shredded before throwing them away. This also includes certain “junk mail” that may contain some of your personal details. Regularly Review Credit Card and Bank Statements – You should also regularly review your credit card and bank statements for any suspicious activity. For example, if you notice any credit card purchases on your account that you didn’t make, it’s likely someone has obtained your credit card number and is using your card illegally. If this is the case, you need to report it to the credit card company immediately. Keep Your Online Transactions Safe – It is also essential that you keep all your online transactions safe. This means clearing all your passwords and logins, especially if you’ve been using a public computer. In addition, it’s typically better to use credit cards rather than debit cards when making online purchases. This is because credit cards usually have better guarantees if there is an issue with payment. Also, be careful to verify that you’re always on a legitimate website with security features before entering any of your personal or financial information. Hot Tip: For more information on this topic, check out our article on the 5 Best Ways to Keep Your Credit & Personal Information Safe. When you have a higher credit score, it can literally open up a number of “financial doors” to you: lower interest rates on loans and credit cards, higher credit limits, and the ability to borrow funds to purchase a home or car. At Upgraded Points, we provide details on how you can attain and maintain good credit, as well as other key tips on ensuring that you keep your credit information safe and secure. We also offer in-depth reviews on a wide variety of different rewards credit cards, which can help you in determining which may work the best for you and your financial goals.